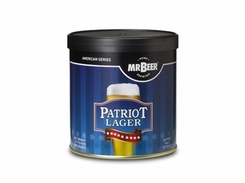 Patriot Lager NET WEIGHT 1.87 POUNDS (850 GRAMS) This recipe will produce 2 gallons of beer in approximately 2 weeks. Rich golden color, exceptionally well balanced full malt flavor and mild bitterness, with a subtle hint of finishing hop aroma. This beer is the perfect example of the typical American lager style, a great beer for all occasions.